I was so taken with “The Blackcoat’s Daughter” that it made my “best of the year” list, and a RogerEbert.com article where I claimed that the movie was “guaranteed to haunt your nightmares” ended up being prominently quoted on the film’s Blu-ray case. You know a horror film has worked its magic on you when you sense its presence hovering over your bed at night. Perkins draws inspiration from some of the scariest movies ever made—the snow-caked isolation of “The Shining,” the demonic overtones of “The Exorcist,” the atonal ambience favored by David Lynch—while crafting a cinematic language that is entirely his own. Cinematographer Julie Kirkwood often frames the backs of characters’ heads or faces concealed in shadow as a way of gesturing toward the “unknown”—the biggest “unknown,” of course, being death itself. An empty boarding school during winter break is an ideal setting for this sort of visual approach, and that is where much of the picture takes place (the score by Osgood’s brother, Elvis, adds immeasurably to the film’s eerie tone). Perkins begins his excellent audio commentary track on the film’s Blu-ray disc by revealing how a key outfit worn by Kat (Kiernan Shipka) was inspired by the heroine of Ludwig Bemelmans’ classic children’s book, Madeline. The final lines in Perkins’ script, “And there’s nothing else,” is a variation on the famous last words of Bemelmans’ book, “And that’s all there is, there isn’t anymore.” Whereas Madeline is nurtured by the headmistress and peers at her boarding school, Kat is completely alone. She’s lost her parents and is treated by Rose (Lucy Boynton), an older student tasked with looking after her, as a burden. There is a void within her that needs to be filled, and it’s not long before she receives a mysterious phone call that triggers her transformation. Whether Kat is being possessed by Satan or is undergoing a psychological breakdown is left up for audiences to interpret. “What’s important is that we are watching this person go through this ‘thing’—what the thing is is kind of between her and the thing,” Perkins told me. “It’s like trying to reach a loved one who is in the throes of a traumatic experience—a breakup, a drug addiction, a death, or something like that. There’s no way into it. I’ve experienced the loss of people who are very significant to me, but that doesn’t mean that when my friend also experiences the loss of a significant person that I have any way into it. It’s a very private experience.” Though there are fleeting images of bodily contortions and levitations, they could easily have been envisioned by Kat’s deranged mind. Perkins wisely decided to forgo the use of demonic facial prosthetics, which would’ve obscured the subdued majesty of Shipka’s astonishing performance. Aside from one climactic howl, she never raises her voice, even while hurling a galvanizing expletive at two gobsmacked women. Overcome by the sudden power that has filled her lungs, she stares at her prey with fierce eyes as a tear rolls down her cheek. Later on, when she calmly raises her arms over her head and replies, “Hail, Satan,” she appears fearsomely in control rather than out of her mind. Like Norman Bates, she’s simply focused on getting her job done, no matter how gory it may be. 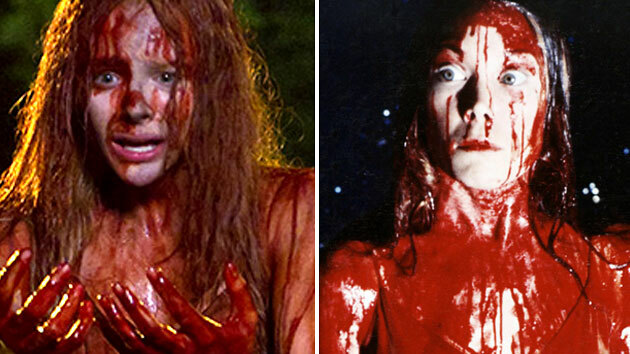 And like Hitchcock, Perkins understands that the worst imagery must be implanted in our minds (in this case, a series of beheadings) without allowing us to actually see it, though there are plenty of subliminal references to decapitations, such as when Kat holds a photograph of Rose, scraping her thumbnail across the girl’s neck. Clocking in just over 90 minutes, the film is impeccably divided into three chapters, each named after one of the main characters—the third being Joan (Emma Roberts). Her parallel storyline, where she hitches a ride from a long-suffering couple (James Remar and Lauren Holly), seems baffling until the film’s exact halfway point, where one new piece of information sets off several revelations. Joan initially resembles Marion Crane, a young woman on the run who is jittery around strangers but is prone to cracking a gleeful smile in private. Yet Joan is also prone to wielding knives, and is gradually revealed to be an older version of Kat. Perkins derived her name from Joan of Arc, since she’s essentially on a pilgrimage, supposedly guided by a “higher power” that instills her with a perverse sense of purpose. She’s no different from any fanatic who kills in the name of their god, and her tendency to latch onto coincidences as signs from above (or below) only intensifies her certainty. If one interprets the devil as a figment of Joan/Kat’s imagination, it makes the film’s final passages all the more chilling. After an exorcism supposedly severs her connection with Satan, Joan strives to retrace her footsteps by committing the same grisly acts in the hope that it will once again make her one with the devil. Of course, how can one bring to life an entity that was originally an illusion to begin with? In the film’s final, devastating shot, Joan appears as lost as James Stewart at the end of “Vertigo,” perched on a desolate road with nowhere left to go. When she hollers in agony, it’s as if she’s crying for her long-deceased mother. “I love her in that moment because I understand how she feels,” Perkins notes in his commentary track. Nearly a decade after losing his father, Perkins’ mother, Berry Berenson, died on 9/11 as one of the passengers on American Airlines Flight 11, after it crashed into the North Tower of the World Trade Center. This tragedy lends enormous resonance to the film’s motifs evocative of motherhood, such as the milk truck glimpsed outside a diner or the river of milk that Kat vomits up onto the dinner table. In perhaps the slyest nod to “Psycho,” Perkins recruited photographer and longtime family friend Paul Jasmin to portray the ominous voice heard by Kat over the phone. Along with Virginia Gregg and Jeanette Nolan, Jasmin was one of the uncredited actors responsible for creating the voice of Mother Bates in Hitchcock’s “Psycho,” and though his words are obscured in “The Blackcoat’s Daughter,” the familiar quality of his voice is unmistakable. Perkins limits our view of the satanic apparition to a few soft-focus shots of a dark figure with horns, which strengthen the notion that it’s a mere hallucination. If that’s the interpretation one decides to take, then the film could be considered a thematic cousin to Hitchcock’s grand trilogy of films built around characters that don’t exist: “Vertigo” (Carlotta Valdes), “North by Northwest” (Roger Thornhill) and “Psycho” (Mother). Yet the film works equally well as a portrait of demonic possession, complete with multiple homages to “Rosemary’s Baby” (the name of the boarding school, Bramford, is lifted directly from the apartment building in Polanski’s film). However, even in that scenario, the madness ultimately exists in Joan’s head. Satan may have been exorcised from her body, but her heart still yearns for him. Perkins’ commentary track is chock-full of witty asides. When Kat carefully adjusts a spoon on a table, the director quips, “That’s when you know you’re going crazy, when you feel compelled to straighten cutlery.” He’s as entertaining as the film itself, yet what struck me the most about his observations was how they further illuminated the overarching despair in the narrative. Though Joan has an extended visit in a motel room, Rose is the true Marion Crane figure, representing young life that is doomed to be senselessly lost. While much of the film is shrouded in brown colors intended to convey the warmth felt by Kat in her newfound identity (crystallized in the heat of the boiler room), Rose is often accompanied by a delicate shade of blue. When Kat tells Rose that she “smells pretty,” Shipka delivers the line as if she’s sniffing a flower that she’s about to pluck from the earth. The dread reaches a feverish pitch once it’s revealed that Remar and Holly are Rose’s parents, and that Joan sees them as her next blood sacrifice. Holly had told Perkins that she based her portrayal off her own mother, who was so ravaged by a tragic loss that she “turned into someone else.” It’s a testament to the humanity of Perkins’ artistry that when the violence arrives, it isn’t pleasurable in the slightest. The deaths of each victim are agonizing to witness, even in the case of characters we’ve barely seen prior to their demise. In the early morning hours of May 30th, the day of the film’s Blu-ray release, a 16-year-old girl in Skokie, Illinois, stole a knife and machete from Walmart, hailed an Uber and proceeded to stab the driver—a complete stranger—to death. The circumstances of this real-life murder were shockingly similar to the fictional one that concludes “The Blackcoat’s Daughter,” and though the similarities are purely coincidental, they made my recent viewing of the film all the more emotional. While many horror directors romanticize the spectacle of bloodletting, Perkins makes us ache for both the victim and the killer. We aren’t thrilled by their pain, we feel it and are scarred by it. That is the pathway to empathy.